Cost included in festival admission fee. Please join us at Lincoln Center on July 5, as audience, and as participant to gain a glimpse of Kabuki and Kabuki Dance, as a part of Meet the Artist Saturdays at the David Rubenstein Atrium at Lincoln Center! Sachiyo Ito and Company will present exquisitely beautiful and elegant Japanese classical dances. The program will include Kabuki dances from 19th century, such as Fuji Musume (Wistaria Maiden), and Mitsumen Komori (Three Mask Lullaby) originally staged in 1826 and 1829. To familiarize audience with Kabuki for the Kabuki performance in the following week at the Lincoln Center Festival, Sachiyo Ito will offer a demonstration on Kabuki dance with various styles of walk by characters in Kabuki plays, use of stage props such as a dance fan. 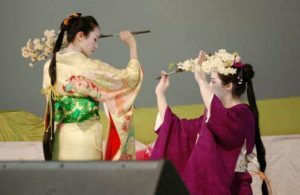 We will invite audience to stage for experiencing a Japanese classical dance with fans. Lastly a work choreographed by Sachiyo Ito in Kabuki dance style will be presented. Sachiyo Ito will perform Kurokami, the Jiuta-mai in this celebratory concert. 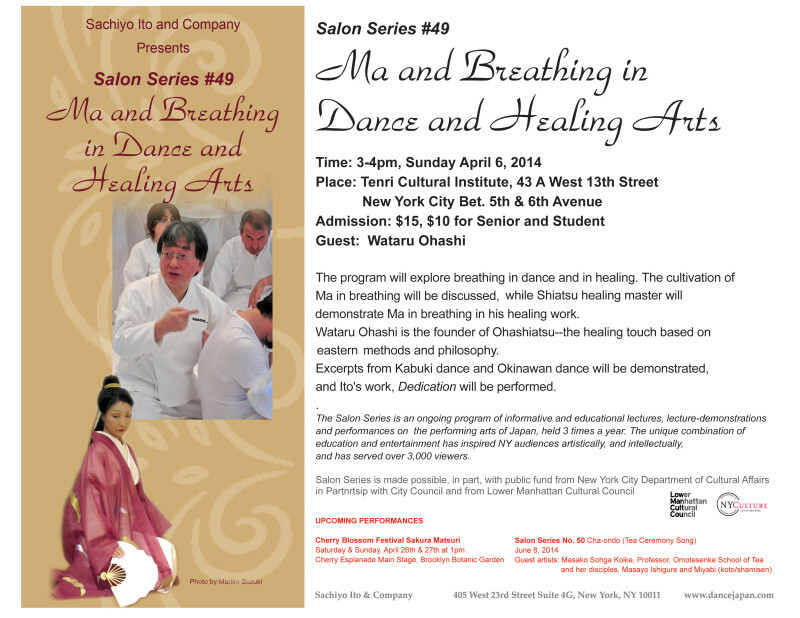 The program will focus on the highest technique in dance, the breath work. Cultivating the best uses of timing, “Ma” in executing breath with movements is the last stage of learning process, and the mastering is essential in order to be a professional performer. 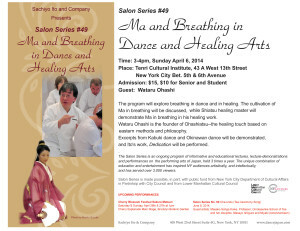 While shiatsu healing master will demonstrate Ma in his healing work. The prevailing theme of Salon Series in 2014 Season is “Ma,” the particular sense of space and time in Japanese arts and culture. The first in the program investigates Ma in creating sacred space and time through sutra chanting and writing, music and dance improvisation.